By now you know that we're well into fall—the time for transitional dressing from summer into autumn is over. But November (and by association, the holidays) is now creeping in, so we're gearing up for a whole new transition: from cool to cold. From accessories to outerwear, shoes and more—we selected 10 perfect pieces to buy and wear now, that will also work with your wardrobe well into the winter. Click through for our essential transitional pieces for the fall to winter season. An unlined leather jacket is perfect for mild and cool weather. However, as we ease into deep fall and then into winter, you'll want something a bit more cozy. This season we're loving all the leather (and faux leather) jackets that are lined in plush pile and shearling. Not only does it add texture and detail to the look of the jacket, but of course more warmth, too. 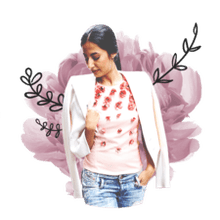 There's no need to blow your whole fall/winter shopping budget on a trend-forward jacket like this, so we rely on shops like H&M and Topshop to supply more affordable options. The above jacket from H&M is less than $75 and seriously stylish. Shop the look: H&M pile-lined biker jacket, $70. You probably don't need us to tell you this, but a pair of minimal, low block heel black leather ankle boots is probably the most useful and versatile footwear in your fall and winter wardrobe. Not only can you wear them with your trusty ultra-skinny jeans and jeggings, but with skirts and tights, too. If you want to be very au courant, try them as above with a pair of cropped flare jeans. Finding just the right pair of black ankle boots is a matter of taste and budget, but we happen to love those that come in an easy pull-on style and have a nice, pointed toe. These Aldo ankle boots have everything going for them and cost just $60. Get the look: Aldo ankle boots, $60. Plaid — a perennial menswear print favorite — translates very well to trousers, coats and jackets, but we're especially fond of an extra-large (and extra versatile) plaid scarf. An extra-large blanket scarf can we worn as a shawl or wrapped around your neck for warmth — wear it over just about anything. Get the look: Madewell plaid scarf, $40. If you're in need of a pair of jeans to completely transform your denim game for the coming seasons, all you have to do is look backwards. Vintage and reworked styles are the most popular jeans of the moment, and brands like Re/Done are taking unique, dead stock Levi's jeans from the 80s and 90s and reworking them into more modern, flattering fits. These jeans are great if you want to let your ankles show a bit (with sneakers or ankle boots) or go for a quirkier look and allow a peek of printed socks show — think of it like an updated version of "nerd chic." Get the look: Re/Done 'The High Rise' reconstructed jeans, $280. The thing about hats is that they can manage to be both practical and whimsical at the same time — adding character and a bit of warmth in the fall. We love a wide-brim style, it walks the line between a cowboy and Indiana Jones — just add a plaid scarf and a coat for an adventurous fall look. Get the look: Brixton 'Homestead' wool fedora, $88. If you love your sweaters slightly oversized, consider shopping from the men's department. We have always ascribed to that whole "borrowed from the boys" look, but this is more like — skip the boys altogether and buy something nice for yourself! This season we're particularly smitten with vintage and heritage-inspired knits, like this fisherman's sweater from L.L. Bean. We'd wear it with everything from lazy Sunday leggings to our favorite distressed denim and a pair of heeled boots and a scarf for a chic fall outing. Get the look: L.L. Bean men's heritage fisherman sweater, $150. Transitional season dressing is a lot about the accessories. Certain items are perfect for signaling the end of one season and the start of another, and they can also carry you easily in the same way. A faux fur stole is exactly that—you can wear it now over sweaters or a leather jacket, and then later over you down coats and wool topcoat, too. It adds a touch of cold weather glamour to any outfit. Get the look: Zara faux fur stole, $50. Get the look: L.L. Bean Bean Boots, $112. Mini skirts are not just for summer. Right now, in October, you can get away with pairing your minis with bare legs, a sweater and ankle boots. As the temperatures drop further, layer in tights and a long wool overcoat. Shop the look: Topshop MOTO denim skirt, $55. You might not immediately think of sunglasses as a "transitional piece" — but we certainly do. The bright, mirrored and colorful lenses that are so popular in the summer don't always feel right for the fall and winter. This time of year, let the color of your shades reflect the color of the changing leaves, and opt for something a little more subdued. We're big fans of tortoise frames with brown lenses because they go with everything and add a softer element to your accessories game. Get the look: Carrera Eyewear 49mm round sunglasses, $120.